Without a doubt, one of the best things about my degree at Cardiff University has been the wealth of opportunities to gain experience and skills outside of the undergraduate teaching. For me, this has involved doing a placement year, two research internships, research assistant roles and voluntary work – all of which I think helped when it came to applying for postgraduate study, and some of which were probably unique to being at Cardiff University. In my second year, I was a Wellbeing Champion volunteer with the university’s Counselling, Health and Wellbeing Team. This involved being out and about on campus and talking to students about mental health and wellbeing (something that fits well with my interests), as well as being involved in health campaigns and writing blogs for the university website. In the summer following my second year, I did a research internship within the School of Psychology. Something that’s particularly good about internships at Cardiff University is that there’s lots of funding available (e.g. School-based funding, CUROP). You get paid for doing work that is fascinating, expands your knowledge of your degree subject, teaches you new (and relevant) skills and looks great on your CV! This internship was in the area of fertility and assisted reproductive technologies, which is a topic I never would have guessed psychologists might be involved in prior to coming to Cardiff. I also picked up some additional paid research assistant work on a project evaluating a new online tool for assessing dyslexia in university students. These summer research activities meant I entered my placement year feeling reinvigorated about psychology as a subject, as well as having new skills and a lot more confidence in working with large datasets. 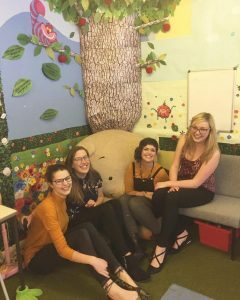 I did my placement year in an NHS Psychology Service for children and families, and whilst this blog is full of positive experiences, for me the placement year was my absolute favourite part of my degree. My role was varied, and involved: helping to facilitate a Dialectical Behavioural Therapy (DBT) skills group for teenagers, observing therapy sessions with families in a diabetes clinic, conducting telephone interviews with young people and families, attending a wide variety of consultations, meetings and continuing professional development activities and producing service evaluations and small scale research projects. Alongside my placement, I took an evening course in Counselling Skills at the Cardiff University Centre for Lifelong Learning, which complemented to the skills I was learning on my placement. For the latter part of my placement, I also started volunteering in another NHS service; an early intervention service for people experiencing their first episode of psychosis, in addition to my main placement. Gaining this additional experience was far easier than it would have been had I tried to get something similar after graduating – I already had a contract with the health board and my supervisor at my main placement was able to introduce me to the team I wanted to volunteer with via email. The opportunities resulting from my placement didn’t end there – I was also offered another (paid) summer research internship by a psychologist working both in the service I did my placement in and within the School of Psychology at Cardiff University. The summer following my placement, I worked on a project evaluating language development in toddlers from disadvantaged backgrounds who had received a nurse-led early intervention programme – again, learning new and relevant skills. This work developed into some further part time research assistant work on the project once term started again. These varied experiences outside of the taught part of my degree were both a valuable and interesting use of my time, as well as relevant to the direction I hope my future career will take. In my first year at Cardiff I wasn’t particularly interested in following a research career, but having the opportunity to be involved in such interesting research at the university has nurtured a desire for research to be a part of my future career – and to this end I will be starting a research PhD in September (a road I definitely didn’t think I would go down when I was in my first year!). In this blog I’ve talked about the experiences I’ve had at Cardiff University, but this is by no means a comprehensive account of what’s available. The huge diversity of opportunities at Cardiff University means you’ll be sure to find something that suits your interests if you fancy taking on some extracurricular activities outside your degree! There’s lots of voluntary programmes available through both Student Volunteering Cardiff (SVC) and Cardiff Volunteering, help with funding to volunteer abroad via the Global Opportunities Centre, free language courses via Languages for All and an impressive list of societies and sports clubs. Don’t forget that if your results aren’t as you expected, Cardiff University has opportunities available through Clearing. Find out what courses are available for entry in September 2018 by visiting us here or calling us on 0333 241 2800 once you’ve received your results! — The Child and Family Psychology Service placement students, June 2017.